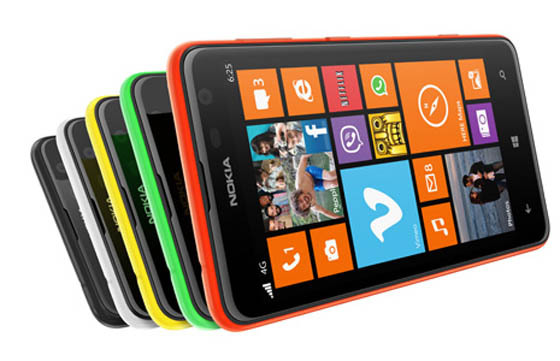 Nokia’s new smartphone Lumia 625 is now available for pre-orders in India through online retailer flipkart. The price of Nokia Lumia 625 is Rs 19,499 and it will be available from end of this month.Nokia has officially announced Lumia 625 in last month. The smartphone sports with a 4.7 inch display with a screen resolution of 800 x 480 pixels with a pixel density of 201 ppi.The smartphone is chipped with a dual-core Qualcomm Snapdragon S4 Plus processor with 512MB of RAM.and it runs on Windows Phone OS. Nokia Lumia 625 comes with 8GB internal storage which can be expandable upto 64GB via microSD card slot.Nokia Lumia 625 comes with 5 megapixel rear camera and 1.2 megapixels front camera for video calling. The connectivity features of Nokia Lumia 625 are Bluetooth,GPRS, EDGE,3G, microUSB,Wi-Fi, 3.5mm audio jack.The battery capacity is loaded with 2,000mAh,which gives standby time upto 15 hours for 3G network. The handset is available in 5 Variants i.e Red, Green, Yellow, Black and White.